· Alfred Charles Howell was born at Bethesda, near Bangor, in 1866. He was the son of the Reverend William . and Mrs Ellen Phillip Howell . He had an older brother and sister and a younger sister . Prior to ordination at St. David’s Cathedral in 1865, his father worked as a schoolmaster at Bangor. After ordination, he became vicar of Garthbregny with Llanfihangelfechan (diocese of Swansea and Brecon) in 1867. The entire Howell household moved south from Caernarvonshire to Breconshire. · The 1881 Census showed the Howell family as residents of Lower Chapel Village near Brecon. The Reverend William Howell continued to serve as the vicar of Garthbregny Breconshire. The oldest son (Elias Philip Howell) is an undergraduate student at Jesus College, Oxford. Alfred Charles, now aged 15 years, and the two daughters, remained a part of the household. The household consisted also of a married domestic servant (Margaret Prosser, aged 20 yrs of Llanfigan, Breconshire) and an assistant servant/scholar (Thomas Lloyd, aged 12 yrs. of Garthbrengy). · By the time of the 1891 Census, Alfred Charles Howell, now aged 25 years, had himself completed theological education, was ordained as deacon and had begun a 9-year curacy at Langley Green, Worcestershire, with Canon Michael Pryor at Holy Trinity Church. · Alfred Charles Howell was married to Alice Gertrude Orpwood in July 1898 at St. Peter-le-Bailey in Oxford. Alfred was 32 years of age and his bride was 9 years younger. Canon Michael Pryor conducted the service. Through this marriage, the Revd. Alfred Charles Howell and Canon Pryor became brothers-in-law . · In March 1900, at the age of 34 years, the Revd. Alfred Charles Howell was instituted and installed as the vicar of St. Matthew’s, Wolverhampton. He succeeded the Reverend Sampson Cordon who had served there as vicar since November 1889 . The net value of the living at St. Matthew’s at the turn of the century was £300 per annum. · The 1901 Census indicated that the marriage had produced a daughter. Muriel Irene Gertrude Howell had been born in 1900 at Langley, shortly prior to the family’s move to Wolverhampton. At this time, the Howell household consisted also of Elizabeth Guest (domestic cook and servant, aged 18 years and single) and Mary A. Jones (domestic nurse and servant, aged 16 years and single). Both had been born in Langley, Birmingham. · During his time at St. Matthew’s, Howell witnessed the removal or closing down of several large works. He consequently witnessed and took an active part in the relief of the distress caused through unemployment. He served as a member of every committee formed for that purpose, and generally acted as secretary. He was elected a member of the Wolverhampton Board of Guardians in 1905  and also of the Wolverhampton Distress Committee . · Howell also served as an inspector of the religious instruction given in the council schools of Wolverhampton, and as assistant diocesan missioner for the Diocese of Lichfield. · During his time at St. Matthew’s church, the Reverend Howell also had oversight of the daughter church of St. Silas in Monmore Green . He was supported in his ministry by five curates – Revd. E.F.F. Despard (1900-1903); Revd. W.E.Wibby (1901-1902); Revd. 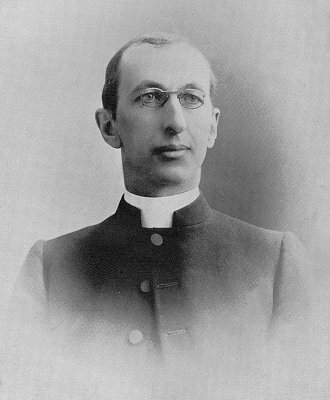 G.W.Litting (1903-1905); Revd. L.E.Marton (1905-1907) and Revd. Arthur T.Stephens (1907-1910) . · We learn that during his ministry at St. Matthew, Howell also oversaw some structural improvements to the church building itself. In 1905, for example, the church exterior was restored and new windows were installed at a total cost of £220. In 1909, the sanctuary curtains were removed and the east wall of the chancel was faced with encaustic tiles at a total cost of £16. The money was raised by voluntary contributions. Indeed, during his ministry at St. Matthew’s, upwards of £1000 was spent on the church in renovations and improvements. · In March 1910, the Reverend Howell left St. Matthew to be instituted and installed as the Rector of All Saints Church in Broseley (Shropshire, diocese of Hereford). He succeeded the Reverend George Fleming Lamb who had been rector of Broseley for 36 years. Lamb retired on the grounds of ill health in November 1909. Howell’s installation and induction was conducted by the Lord Bishop of Hereford (Dr Perceival) during which he was welcomed as ‘another labourer in God’s vineyard’. The living at Broseley was the gift of the patron, the Lord Forester . The latter addressed the assembled congregation ‘with much earnestness’ and reminded the new rector of ‘his numerous duties’ and of ‘the seriousness and solemnity of the charges he had taken over in the parish’. He was to be ‘diligent and faithful to the Bible and also to the exposition of it’. He needed to be ‘an earnest preacher of the Gospel of Christ’. He was to gather his parishioners at the Holy Communion ‘that they should be a parish of church communicants, going in the way that the Lord invited them to go’. He was to stand among his people ‘as the Lord’s messenger, as an interpreter of the word of God’. He was ‘to live and labour among them’. He was ‘to be on watch against every evil influence which might creep into the societies’ and he was to watch ‘every weak member of the church’. He was to be ‘ a guide to the young and see that they were brought up in the fear of the Lord’. He should be also ‘a comforter to the aged’. He urged the parishioners to support their new rector in every way . May 1910 – Howell leads a special service to mark the death of King Edward VII. We read that ‘the inhabitants of Broseley joined in the general mourning of the loss … the shops and other places of business were closed throughout the day, and the publicans closed from 12 till 6 o’clock. The people generally were sombre clad, and blinds were drawn at nearly every house in the town. The church was appropriately draped in “the Royal Purple” and great solemnity prevailed among the large congregation’. Howell delivered ‘an admirable address on “The World in Mourning” referring in sympathetic terms to the great loss the nation had sustained by the death of the late lamented Sovereign’. October 1911 – Howell leads a choral service to dedicate a solid oak reredos which had been extended through the generosity of the patron, Lord Forester, in memory of his own parents. March 1912 – Howell issues a notice entitled ‘A Call to Prayer’ in which he urges all parishioners to attend a service of intercession at the parish church in order to ‘come and seek by prayer God’s guidance and help in the present crisis’ . June 1922 – Howell leads a service to dedicate a war memorial in All Saints Church at which the Bishop of Hereford was in attendance. · In October 1922, the Revd. Alfred Charles Howell – now aged 56 years – moved to yet another parish. The parishioners of Broseley presented him with a cheque for £34-9-6 as a mark of their esteem as he departed for the living of St. Lawrence in Little Wenlock. There the Revd. Howell succeeded the Revd. J.W.Johnson (who had been rector at Little Wenlock since 1898). The Reverend W.A.Warner, who preached his first sermon at All Saints in November 1922, succeeded Howell at Broseley. · The Reverend Howell retired from his living in Little Wenlock, in November 1941, at the age of 75 years. The Reverend F.J.R. Mason, who had been rector of Jackfield since 1930, succeeded him and was inducted at St. Lawrence on November 28th 1941. · It is evident that in their retirement years, the Revd. Alfred Charles Howell and his wife relocated to be nearer to their children in London. It was in Pinner (north London) that Alfred Charles Howell died on April 3rd 1954, aged 88 years. His widow, Alice Gertrude Howell, died there on January 14th 1963. Glynne Watkin is a non-stipendiary priest at St. Matthew’s Church, Wolverhampton and is employed at the University of Wolverhampton. He gratefully acknowledges the research support offered by his colleague, Mr. Kenneth M. Oliver. The Reverend William Howell was born in October 1834 at Llanidloes, Montgomeryshire. After serving at Garthbregny with Llanfihangelfechan, he became vicar of Llanddewi (also in the diocese of Swansea and Brecon) in 1903. He continued there until his death in 1908. Ellen Phillip Howell (nee Williams) was born in Bangor in 1832. She married William Howell at Llanlechid, near Bangor, on February 17th 1855. She died in Brecon on December 14th 1911. The older brother was Elias Philip Howell, born at Bethesda in 1858. Having first obtained a BA degree at Jesus College Oxford in 1881, he was ordained at Bangor Cathedral in 1882. He then became headmaster of Bottwnog Grammar School (near Pwllheli) in 1883. In 1900 he became vicar of Pentraeth on the isle of Anglesey. He died at Duffryn, Merioneth, in June 1926. The older sister, Ellen Jane Howell, was born at Bethesda in 1863. His younger sister, Margaretta Grace Howell, was born in September 1870 at Llanfihangel, Breconshire. She died in London in 1927. Michael Pryor had married Georgina Orpwood of New Road, Oxford in July 1887. Family interconnectedness became even more apparent in June 1900 when Alfred Charles’ sister (Margaretta Grace Howell) was married to William Lipscomb Orpwood at Llanfihangelfechan, Breconshire. The Reverend Sampson Cordon first served at St. Matthew’s church as a curate to the Revd. John Eddowes Gladstone from 1881-1883. He then served a second curacy at the church of St. Jude in the town. By 1888, he also served as chaplain to the Wolverhampton Union Workhouse. For biographical detail of all the priests who served at St. Matthew’s Parish Church, see ‘The Parish of St. Matthew: the church and its people, 1848-1998’ by Glynne and Debbie Watkin [Wolverhampton Archives and Local Studies Library]. Also see ‘The Reverend John Eddowes Gladstone: evangelical vicar of St. Matthew’s Church’ by Glynne Watkin (elsewhere on this site). A Board of Guardians was chosen from local gentry, clergy and major tradesmen to control the work of the Wolverhampton Poor Law Union. The Board of Guardians remained in existence until 1930 when local authority Public Assistance Committees replaced them. The 1905 Unemployed Workmen’s Act allowed local Distress Committees to help unemployed workers with small cash handouts or temporary work during times of widespread unemployment. This helped many workers from entering the Union workhouses. For a brief history of the church of St. Silas, Monmore Green, see ‘The Parish of St. Matthew: the church and its people, 1848-1998’ by Glynne and Debbie Watkin [Wolverhampton Archives and Local Studies Library]. For further details of the curates who served at the parish church of St. Matthew (and St. Silas, Monmore Green) , see ‘The Parish of St. Matthew: the church and its people, 1848-1998’ by Glynne and Debbie Watkin [Wolverhampton Archives and Local Studies Library]. The September 1909 edition of the Wellington & Shrewsbury Journal shows that ‘a vestry meeting held at the Town Hall decided to ask Lord Forester to bestow the living at Broseley & Linley on the curate, the Reverend W. Rowland. The petition had been ‘extensively signed’ throughout both parishes. It is not clear why Lord Forester decided to reject the petition and appoint Howell to the living instead. Extracts from ‘The Wellington Journal’, March 1910. This refers to the Miners’ Strike which was affecting the South Shropshire and other coalfields throughout England and Wales.